It’s still too early for the crazy deals at now-liquidating Circuit City. I went by the location in Bailey’s Crossroads off Columbia Pike, looking for a plug adapter for our impending trip to London. I figured we might be getting into crazy-deal territory, since it’s been about a month since they let the liquidators take over and start to clear out the stuff. Most of the stuff was between 10% and 30% off their already high prices. There aren’t any super deals to be had yet. Check back in a couple weeks. It’s doubtful there’ll ever be any real deals. Right. I was there a couple weeks ago and the discounted prices were low enough that I bought something there instead of driving over to Staples to buy it for the same price. Nothing really good and cheap yet but nothing extraordinarily pricy either. As always, the staff mostly stood around and were unhelpful. It’s good to see that some things never change. Sounds like the liquidators don’t have any more of a clue than CC did. Granted there’s almost no margin on electronics, but even if they take a hit, it’s still more than they’ll get if it’s not sold. Yeah, when you add 30% so you can mark it down 30%, it isn’t really a sale. Isn’t that what outside liquidators do? Sell the things you can scam people into buying, then buy the rest yourself for pennies on the dollar and then resell them at the next liquidation you do (or on ebay, or wherever). Part of it is that they start the discounting from the MSRP, not from the price CC would ordinarily sell the item for. And as the Consumerist article Joseph linked points out, the MSRP is the dream-price that’s only ever used so stores can give fake discounts. Part of it is that current-model electronics don’t actually HAVE to be liquidated- most of them can be sold right back to the manufacturer, who can sell them to a retailer that’s not going out of business. After walking in to their Springfield store, I was reminded of Levitz Furniture in Miami, that seemed to have a going out of business sale that never ended. They’ve managed to fill up the parking lot on a consistent basis, and I can’t imagine all those people are walking out of there emptyhanded. 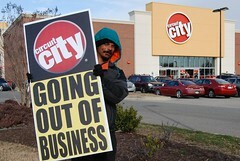 I can’t help but wonder if Circuit City will be having their fifth annual going out of business sale in 2014.